Over the past couple of months, I’ve developed a condition that is affecting my ability to concentrate. It’s called “Microsoft-itis email-culosis.” It’s characterized by an inability to read long emails (more than a couple of paragraphs) and an acute inattention to detail. Something can be spelled out clearly in email and I will miss it. When you verbally ask (or IM) others about it and they tell it to you, it’s the first time you hear about it even though it was in email originally. The further you advance in Microsoft, the more prevalent this condition becomes. This concerns me because I haven’t advanced that much in the company. In children’s books, and on TV shows, vegetables get a bad rap. We aren’t supposed to like green vegetables. I remember in 8th grade there was a book called “Those Green Things” where the protagonist of the book was saying how much he disliked brussel sprouts. On an episode of the Simpsons, Homer once died choking on a piece of broccoli. 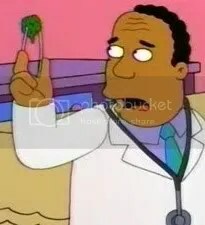 Dr. Hibbert warned that broccoli is dangerous because of its terrible taste. But the thing is that I like green vegetables. I like them quite a bit. I enjoy bok choy, asparagus, brussel sprouts, asparagus and broccoli (if they are cooked). I used to like vegetables raw, and still enjoy raw carrots and green peppers, but I like cooked green vegetables more. This is a good thing because one shortcut to remembering how to eat healthy is simply this: eat more green vegetables. The fact that I enjoy most of them – even green beans (sometimes) and snap peas – makes it easier. The only green vegetable that I am exposed to regularly that I am not that much of a fan are green peas. To me, those are just alright. I will pass on those and take any of the aforementioned vegetables. I’m not sure when my tastes shifted, but over time they have. Now, contrast that to fruits. I am much more picky about the fruits that I like. While nobody ever cooks fruits (other than tomatoes, which are a fruit and not a vegetable), a major reason why I don’t like fruits is because I don’t like squishy food. It grosses me out. Cherries in cherry jam? Pass. Fruity bits in strawberry jam? No, thanks. If I put jam onto a piece of toast and I see a large fruity bit on there, I will scrape it off. Mushy bananas? No way. Pulp in orange juice? Forget it. I also don’t like large oranges. I prefer to peel an orange, pull it apart and put the entire single piece in my mouth. If it takes me more than two bites to eat a piece of orange, I won’t eat it. There are not a lot of fruits that I do like, but there are a few. I like apples, especially Macintosh apples (not just because of the computer). However, there are some apples that are really tough to eat (literally physically difficult because of their composition). I also like grapes (so long as they are not so big so as to fit in my mouth), tomatoes, watermelon, papaya (my favorite) and persimmon. Some of these you could argue are squishy, but the texture is different. Not sure what the deal is. Luckily for me, vegetables are more important to your diet than fruits. The reason is that fruits have natural sugar in there and that can spike your blood glucose level. Vegetables instead have vitamins, fiber and are lower in natural carbohydrates. They also grow better in northern (colder climates). So there you have. My list of fruits and vegetables that I don’t like. Entirely reversed around, just for me. Now maybe I’ll go eat a carrot. As I was saying in my other post, bullies were a regular part of my life in school. After I graduated from high school, only then was I able to break away from them where I didn’t have to interact with them regularly. But between grades 7-11, there was a new one every year (sometimes the old ones came back). In Grade 12, I didn’t really have to deal with it that much. I guess people were getting older and had better things to do. But I still remember this one incident very clearly. It was lunch time, and I was walking down the hall in about the middle of the hallway. I went by these two guys and suddenly, one of them (we’ll call him Troy) shouted “Pinball!” But he didn’t say it quickly, he drew it out “Piiiiiin-baaaaaaaaawwwwl!” Troy then shoved me as hard as he could all the way from the middle of the hallway into the lockers on the other side where I bounced off of them. He went out of his way to do this to me. I attempted to keep walking to my destination. What was I supposed to do? Troy didn’t know what to say. Obviously, he didn’t expect to get caught, and he certainly didn’t understand what was going on. The teacher gave him ten seconds to come up with an apology, and when he didn’t, he said “Come with me.” We were only 15 steps away from the front office of the school. He led both of us into the office and asked to see the principal. We got in right away and the teacher led us and had us both sit down in front of her (the principal). The teacher then started to recant the situation. He detailed about how I was walking by and Troy pinballed me all the way across the hall. He then wouldn’t apologize. The principal then took a very tough tone. It was kind of scary (not for me). She started lecturing Troy about how a few years ago, other students started to pinball yet more students, and how they weren’t going to let that happen again. It was a no-nonsense lecture. This went on for maybe a minute or two, and Troy began to break down. That caught me off-guard. He was relying upon me for his defense? I told the truth. “Um, no, it was only halfway across the hall.” I guess that made his crime a little less serious. He continued to receive a lecture, and I watched. But I wasn’t really enjoying it, I felt kind of sorry for Troy, seeing the tears flow like that. The principal and teacher continued for a little while longer. Truth be told, I don’t remember the rest of that conversation, but I do vividly remember him crying. Anyhow, eventually we finished up and he apologized to me. It was kind of weird because I never had a problem with Troy before. But I never had a problem with him after, either. Yet still, all these years later, I have a negative opinion of him. My only serious interaction with him is the time he shoved me out of no where. That will stick in my head forever. But at least I wasn’t the one who cried. When I was growing up, bullies were a regular part of my life. To this day, I can still name a few of them and while I don’t really think about it very much, if I ever saw a couple of them on the street today, I would go out of my way to avoid them. It just goes to show you that if you’re a jerk early on in life when you meet people, it stays with the people you’re a jerk to. I always was unfortunate enough to be the smallest kid in class. I was hit by a double-whammy wherein because of my religious upbringing, I was not supposed to get into fights at school (I was concerned I would get into trouble at home). Thus, I never fought back. He did this for a little while. I can’t recall how long it was. 10 seconds? 20 seconds? But it made me really mad. He continued to do it and suddenly, my arm flung out from my side and I half punched, half slapped him across the side of the face. It was a slap in that the motion of the movement was like a slap, but my fist was closed. I remember this incident to this day, over 20 years later. I recall that this wasn’t a decision that I made where I evaluated the pros and cons of whether or not I should do it. It just got to me deep inside and it came out almost involuntarily. It’s like a sneeze; you don’t choose to have that sneezing feeling, it just comes on you (like a cough). This was like that. It wasn’t a hard punch either, and I was surprised that I did that. I was more worried about getting in trouble from the teacher than I was about anything else. However, the look on his face was priceless. His jaw dropped and his eyes were wide, in shock that I would dare react that way. I quickly scurried past him and he recovered. He tried to kick me in a martial arts style kick, but all he basically did was raise his leg so that it touched me. It made no impact on me. That was the last time I ever fought back against a bully in school. As I said, I was worried that I might get in trouble from the teacher or my parents. Years later, when I recounted this story, my mom tried to spin it, saying that he was actually complimenting me and that I shouldn’t have punched him. But that’s not true at all. He was clearly in my face, taunting me. At that age, I knew how to tell the difference. Kids aren’t stupid when it comes to bullies. Looking back on it now, I don’t regret for one second punching him in the face (however much of a punching motion it was). I kind of wish I had done it more growing up. You may argue that violence doesn’t solve anything but boy, revenge sure does make a person feel better. Recently on Netflix, I’ve started watching episodes of The Office. I have never been a regular watcher of this show, but I have (somehow) watched most of the episodes of the first three seasons, usually because they have been on TV while I’ve been watching TV. I started watching season 6, then season 5, and am now on season 7. While I always enjoyed the show, I now realize that I find it particularly funny. 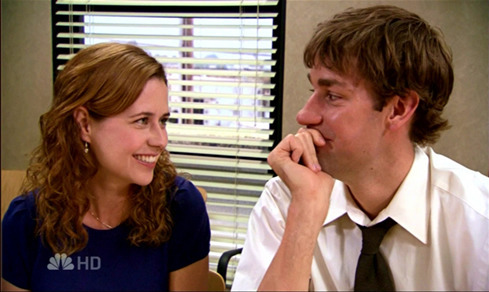 Two of the characters on the show I can relate to – Jim and Pam. These are two characters that started dating on the show (for the story, not in real life) and eventually got married. During another episode, Jim calls up Pam and asks for her help. She is talking on the phone with Jim then says “Oh, you mean you need to put out an APB – attention Pam Beesley!” Silence ensues while Pam grins, waiting for Jim to laugh at her funny joke. Nothing occurs for 5 seconds. “Did the phone cut out?” she asks. For some reason, I found that hilarious. This next bullet point contains TMI, although it’s not that I can relate to it. It’s hard to explain. Jim then looks up and to the side, kind of dips and nods his head, shrugging his shoulders as if deep in thought, thinking things over. He then mumbles “Well…” and shrugs as if to say it depends on the circumstances. Pam then looks and glares at him. I found that scene especially funny. There are all sorts of bits like that. One problem with the far left and the Occupy Wall Street movement (well, I should say my friends on Facebook who support OWS and keep posting links on their Walls) is that their hatred is like a roulette wheel – it changes all the time. I remember being a university student in the late 1990’s. But even before that in high school, Royal Bank announced in the year before they made a profit of $1 billion. My high school physics teacher said in class “Can you believe how much money they made last year? I tell you, when banks start making that much money…” and I can’t remember the rest, but it was something about inequality. In Grade 12, I don’t remember the context but we were talking about business and taxes and regulations in English class. My English teacher gave a bunch of examples but his point was this – Big Business always whines. Thus, even in 1995-1996, people were talking about how greedy business and banks were. They hated McDonald’s and derisively refer to any low-paying, entry-level position as a McJob. They hated Walmart for not paying high enough wages, and putting downward pressure on prices and putting small businesses out-of-business because they couldn’t compete on price. A couple of years ago they hated the oil industry for keeping gas prices too high. Gas prices have been investigated by the government numerous times and price fixing has never been discovered. Last year, during the health care reform debate, they hated the health insurance industry for making money off of illness and running up the costs of health care. Now, during the 2011 Occupy Wall Street protests, they hate the financial industry for ruining the economy and causing economic inequality. I see a lot of people posting articles about how there is so much inequality now and how it got so bad recently. Yet people were talking about it while I was in high school 15 years ago. And that didn’t come out of no where, either: people were talking about how bad it was getting before that. The writer of Ecclesiastes is right – there is nothing new under the sun. That’s my problem with the protestors, or rather, my friends who post all these articles. They seem to think that the 1990’s was some golden age when everyone was equal. The 1990’s were an anomaly, and people were complaining about it back then, too. The early 1980’s had the worst recession since the Depression, and double-digit inflation. The 1970’s we had stagflation and the Vietnam War. In the 1960’s, there was lot of social upheaval due to the civil rights movement and counterculture. In the 1950’s, there was the threat of nuclear annihilation during the Cold War. During the 1940’s, there was rationing because of World War II, and massive rebuilding of a decimated Europe. During the 1930’s, there was the Great Depression. Thus, there never was a Golden Age of economic equality where everyone lived in gumdrop houses and played under chocolate rainbows. Yet OWS (well, my hippie friends) seem to think so. And that’s my beef; we tend to remember things better than they actually were. Yes, we have economic inequality in the US. But that doesn’t mean we should go back to a place we never were. Growing up, I was lucky. My dad built a big enough house and wired it such that I never had to worry about plugging stuff in and it wouldn’t work. Sure, we knew from Louie the Lightning Bug you had to play it safe around electricity. We wouldn’t plug 10 different appliances into the same socket, we would spread them around. It just made sense to do it that way, otherwise you were overloading the plug. However, after I moved out, I began to notice that other places were not wired nearly as well as the place where I grew up. In my condo, we have stopped using the baseboard heaters in the living room and started using a portable furnace that looks like a fireplace. We do this because we can save on heat, and the furnace looks a lot nicer. However, it also draws a lot of power. If we plug it into the wall and run two or three lamps at the same time, the power goes off. Not everywhere, just in the living room. What’s happening is that the circuit is being overloaded and the circuit breaker is kicking in. All of the plugs in the living room – all five of them – are connected to the same circuit breaker. Since the furnace uses 1500 Watts at full power (and we need it because it is so cold now), anything else draws to much power on the circuit. Now, growing up, I never concerned myself with overloading a circuit. Ever. We would plug a couple of appliances into the wall but we wouldn’t worry about whether or not the plug could support it. We would run computers and printers into the same outlet, but seriously, I never worried about whether or not I could run the heat and the lights at the same time. Indeed, I never did this at all, ever until the wife moved her furnace into my place and we started using it instead of the baseboard heaters. I never had to… until now. To get around this, I thought about isolating one plug on a separate circuit breaker, but we decided to take the cheap way out and run an extension cord instead to another part of the house on a different breaker. And that’s the lesson I learned – overloading your circuits matters. Which brings me to the next lesson – extension cords matter. Have you ever looked at an extension cord and known what size it is? I’m not asking you what length it is, but what size? Every time I have ever used an extension cord, it’s to make the plug longer from the TV to the wall, or the laptop to the wall, and so forth. You’ve used them to run Christmas lights. Or run a projector outside. Or something. The size of the extension cord determines how much electricity can run through it. The lower the number, the more power it can handle. This matters because the furnace uses 15 Amps (Amps, or amperes, is a unit of electric current). I had to check my existing extension cords and also check the Internet for extension cord sizes. As it turns out, mine were not heavy enough. I had to go down to the hardware store and look at the size of the cord, and discard the ones that were heavy enough. Unless you have worked with power tools a lot, you’ve probably never cared before. And why would you? Computer stuff doesn’t draw that much power. You just take care to not overload your plugs and if it’s not long enough, you get a thick cord (but not too thick) and make it longer.